As for the the hot dog, there are variants to be found like the Dodger Dog and the Fenway Frank. I grew up eating a Baltimore standard-. 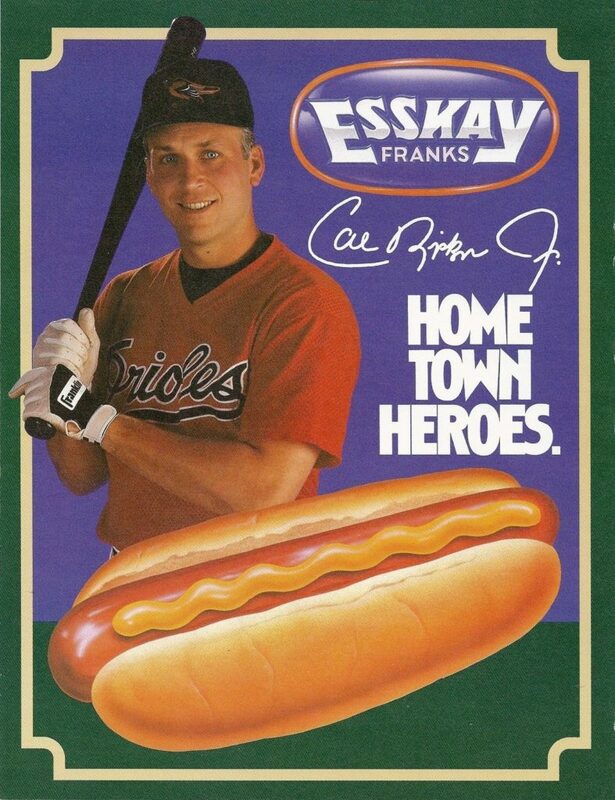 Esskay Hot Dogs (“Taste the difference Quality makes!”). It is reported Babe Ruth once devoured a dozen hot dogs and eight bottles of soda between games of a doubleheader. His “stomach ache heard ’round the world” was attributed to his overindulgence of hot dogs. So how did the hot dog and baseball come together? From the inception of the ballpark eating and drinking were tied to baseball. At the first enclosed ballpark in Brooklyn a saloon sat in one of the outfield corners. Beer was the first consumable to appear in a ballpark. Baseball was popular with the Germans in the Midwest who would drink beer freely during games and enjoy other concoctions. 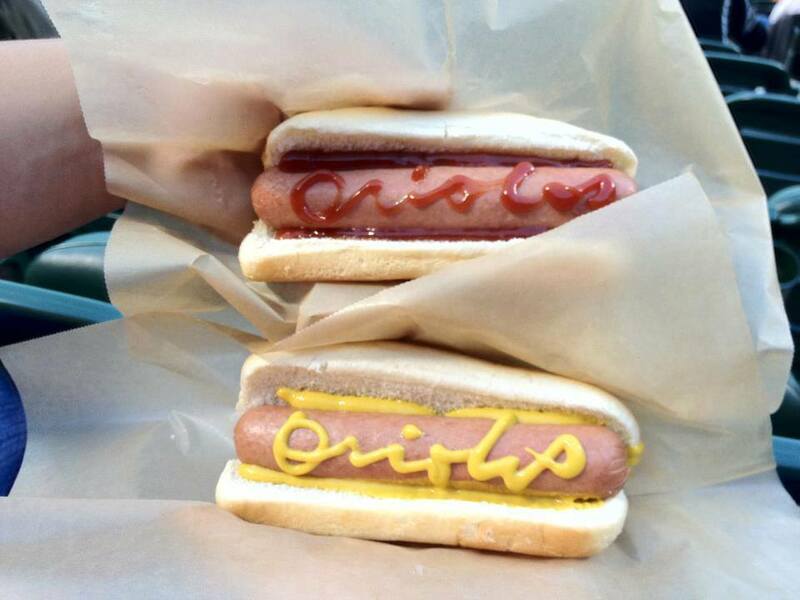 The most famous edible creation ever to appear at ballparks is the hot dog. The hot dog is essentially just a “dash on the doxen” sausage as they were sometimes called and a Vienna roll. So it is very plausible that hot dogs were consumed regularly before they ever entered the ballpark. Some claim hot dogs first appeared at baseball games as early as the 1870s and ’80s. But a more famous legend says they didn’t appear until 1905 when Harry M. Stevens brought them to an early season game in New York. Stevens was an immigrant who came to the United States in the 1870s. He worked as a minister in Columbus, Ohio and was also a part time bookseller. A few businessmen hired him to sell scorecards at Ohio baseball games and he was soon known as the “scorecard man.” Stevens moved to New York and his business expanded from scorecards to concessions. One day when ice cream wasn’t selling well because of cold temperatures Stevens sent some of his employees to get some sausages and Vienna rolls. He sold the combination as “red hots” and the sold well enough that Stevens continued selling them and later expanded his menu. A cartoonist who couldn’t spell the official name of the sausages shortened the name to “hot dog” in 1910 and hot dogs have been in baseball ever since. But the validity of the story is questionable. In 1904, a year before Stevens supposedly invented the creation a cartoonist drew a picture of one at the World’s Fair in St. Louis. And according to some secondhand reports, some students at Yale College claimed to have enjoyed the sausages and rolls as early as 1895. It is likely that the hot dog originated well before Stevens brought it to baseball in New York because it is not a complex item and would have made a reasonable concoction for German immigrants. After all, the hot dog is filling, warm and salty and goes well with beer. These combined tastes may also explain how peanuts made their way into the baseball scene. Roger Weber-History of food at the Ballpark. Happy Hot Dog Day. Enjoy one at the game tonight! This entry was posted on Tuesday, July 17th, 2018 at 4:00 pm	and is filed under History of Taps, Jari's Articles. You can follow any responses to this entry through the RSS 2.0 feed. You can leave a response, or trackback from your own site.